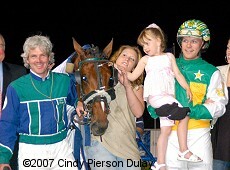 Trainer Blair Burgess (left) and driver Jody Jamieson (right) with Tell All while Jamieson's daughter pets him. One of the richest harness races in North America is the $1.5 million (Canadian) Pepsi North America Cup for 3-year-old pacers. 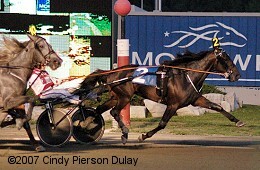 This year, the event was contested at Mohawk Racetrack in Campbellville, Ontario for the first time. It was originally run at Greenwood and then Woodbine in Toronto, but was moved west of the city due to the rescheduling of racing dates. Racing conditions were ideal, with a fast track. temperatures in the 70's, clear skies, no wind, and low humidity. Originally a full field of ten was drawn, but Two Twentytwo was scratched sick the morning of the race, and Reserve Forces was a late scratch after coming back lame after a warmup between races early in the card, leaving just 8 to contest the standard 1 mile trip. There was no clear favorite in the betting, with the three elimination winners going off at the shortest odds. Diplomat Stakes winner Tell All was the slight favorite at 2.35-1 over Burlington Stakes winner Sutter Hanover at 2.45-1, with New Jersey Classic Stakes runner-up Yankee Skyscaper the 2.75-1 third choice. 75-1 longest shot Glass Pack broke stride at the start, while John Campbell sent 18-1 Artriverderci to the front first time past the stands and around the clubhouse turn, loose on the lead by 1 3/4 lengths over 33-1 Domitian Hanover through an initial quarter in 26 2/5. Down the backstretch, George Brennan made his move behind Yankee Skyscaper, taking the lead at the 1/2 mile marker in 54 3/5 while Brian Sears and Kenneth J moved up to take second. Jody Jamieson and favorite Tell All sat back in fourth out wide down the backstretch and into the far turn. Yankee Skyscaper continued to lead at the top of the stretch after 3/4 in 1:23 2/5, but Tell All was quickly closing the gap. With 3/16 of a mile to go, Tell All ran right by the tiring Yankee Skyscaper and pulled away to win by 2 lengths over late-running Sutter Hanover in 1:50 3/5. It was another 2 lengths back to 32-1 Watta Hotshot in third. 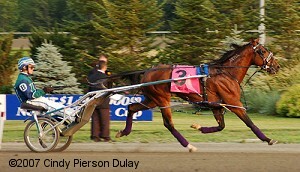 Kenneth J faded to finish fifth while Yankee Skyscaper tired late and was sixth. Tell All wins the North America Cup. Tell All heads to the winner's circle after the race. His driver Jody Jamieson, celebrating his first North America Cup win as the youngest driver to ever win the event, said, "I figured the best two horses in the race, one was parked out in the first turn, and the other took a long time to clear. I was there a little early, but, (Tell All) was grabby and wanted to be out there, so I just moved him and let him sit. This horse has done everything I have ever asked him, I asked him pace, took him out to the last turn, probably got a little over anxious, drove him to the wire, because he just jogged. Yes, I pulled the plugs, he is just an amazing colt, and he keeps going all the time. Just a thrill. This is amazing, this is got to be the top one, the biggest thing in the world." 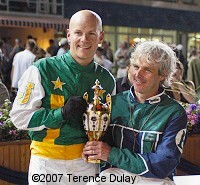 Driver Jody Jamieson and trainer Blair Burgess pose with the North America Cup trophy. Burgess said, "I like the early parts of the trip, it looked like there was plenty of speed. I didn't think the track was really, really fast, I thought the speed was plenty. I winced a little bit when he came first over, against (Yankee Skyscaper), but, he toughed out, and looked to be the most powerful one. I thought he was a winner, I thought we were not finished with Sutter Hanover, he was still coming, I felt more and more confident as he came down the stretch." Tell All warms up earlier in the day with trainer Blair Burgess driving. 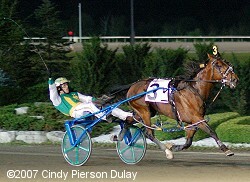 Burgess said, "Meadowlands Pace is the plan. Just take the two week race, he probably he needs one now, he had eleven starts this year, that plenty. He looks a lot like his father, and acts like his father. 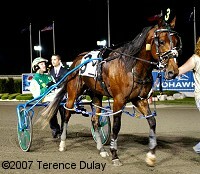 Real Desire made 3 million dollars, this horse has a long way to go yet, he just got two, three and four. He is won his way, he is working in that direction." Second place finisher Sutter Hanover in the post parade. His driver Dave Miller said, "It went it exactly like I thought it would. I thought with George having the rail, he was to get away fourth, it is a tough current first up, I figured he was going to move back, I was right where I wanted to be in the last turn, I thought I was in good shape. My horse raced good, but Jody's horse raced better. I could not asked for a better trip. Well, I am sure, he is a very big strong horse, he has got a lot of ability. I think you will see a lot more of him in the summer." Third place finisher Watta Hotshot in the post parade. His trainer Scott Bell said, "He went really well. That was the best I could've hoped for. He's been a little sick all week. We came here hoping for fifth money and we were third." 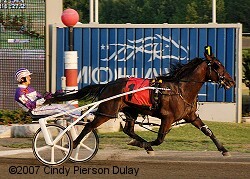 Along with the main event, there were seven other stakes races on Saturday night at Mohawk. Four finals of the Classic Series, each for a purse of $265,350 were contested, each at the extended distance of 1 3/8 miles. History was made in the Pacing Classic for older horses, when 6-1 Boulder Creek not only upset 2-5 favorite Lis Mara by 1 1/2 lengths, winning this race for the third year in a row, but also set a new world record time of 2:33 2/5. 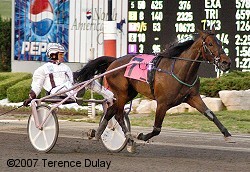 Driver Daniel Dube said, "I got a perfect trip in here and this horse has so much class. When you have a nice horse, they do the work for you. I wanted to race him from behind but nobody else was on the gate so we just left out of there pretty easily. Then, when Lis Mara pulled, I just sat on his back the whole way around and it was easy from there." The $100,000 North America Cup Consolation featured horses who did not qualify for the Cup final. 12-1 longest shot Laughing Art, driven by David Miller, enjoyed a pocket trip until mid-stretch, then slipped through on the rail to defeat 8-1 Trueys Legacy by 1 3/4 lengths in 1:51 2/5. Even-money favorite Bettor Tuwin tired late after stalking the pace and finished last of six. In the Classic Oaks for trotting fillies and mares, 9-5 favorite Buck I St Pat rallied from ninth early, circling the field wide around the far turn to win by 1 1/2 lengths over 7-2 third choice Passionate Glide in 2:40 3/5. 3-1 second choice Birminghim was third. Winning driver Brian Sears said, "I never get her to the gate early because she's had some issues about that in the past. I was content where we were sitting throughout the mile and when I pulled her and asked her to go, she really responded well. She has a real good late kick to her, and that's how she got there tonight." 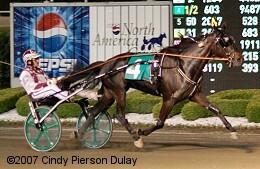 2-1 favorite Quite Easy lived up to his name in the $334,600 Goodtimes Stakes for 3-year-old trotters, as he took over the lead with a half mile to go, pulled ahead to a 2 3/4 length advantage at the 1/8 pole, and held off 29-1 longshot Monkey Bones to win by 3/4 length in 1:56. 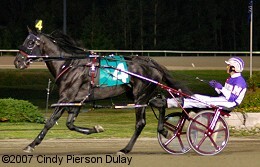 It was another 1/4 length back to 4-1 third choice Xactly Hanover in third. 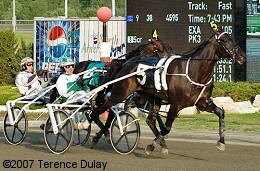 Winning driver John Campbell said, "I really didn't know what to expect out of this horse in this race. I got to the front early and the horse really just swelled up and wanted to keep on going. He never seemed to get tired and I never pulled the plugs. Hopefully this colt, if he stays healthy throughout the season, will be in good shape to be a sharp contender in this year's Hambletonian." 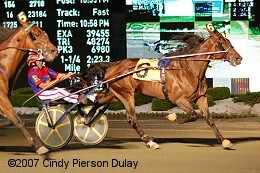 The $531,800 Elegantimage Stakes featured 3-year-old trotting fillies at the standard 1 mile distance. 1-2 favorite Pampered Princess did not disappoint, taking over the lead down the backstretch and stealing drawing away to win by an impressive 4 1/4 lengths over 8-1 Godiva Hall in 1:55. 5-2 second choice Vulcanize was third. Winning driver John Campbell said, After the recall I wasn't sure what would go on in this race. This filly is very versatile and she's much bigger and stronger than she was as a 2-year-old. 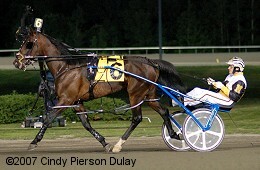 I think the plan is for her to race in the Del Miller as a prep for the Hambletonian or Hambletonian Oaks." In the Trotting Classic for older horses, 8-5 second choice Vivid Photo sat back in sixth early then powered to the front at the top of the stretch, holding off late-running 9-1 JM Vangogh by 1/2 a length at the line in 2:39. 3-4 favorite Sand Vic stalked the pace in second but faded late to finish fourth. 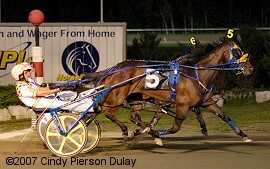 Winning driver and trainer Roger Hammer said, "This horse is lucky to be back racing as tough as he is, especially after the infection he had. He's good, but I wasn't sure if he was sharp enough to go this distance. We're pointing him next for the Titan Cup, and then we'll bring him back up here for four months, as long as he stays healthy." The Classic Distaff for pacing fillies and mares saw 5-2 second choice Moving Pictures lead the field for the first half mile, then relinquish the lead entering the stretch only to fight back to get the win by a neck over 9-2 Vysoke Tatry in 2:37. 2-1 favorite Marnie Hall failed to fire and was last. Winning driver Mark MacDonald said, "I was a little concerned at the head of the stretch because I had nowhere to go and I had a ton of horse. I thought if I could get out she could be right there, but it was tough going for a while. This mare is just a big plugger and she just keeps on grinding and coming on and coming on. She impressed me here tonight."